I used to make a hot-cocoa mix to be made and served at my college cafe. I called it Vee’s Magical Hot Cocoa. And magical it is. Not only will it kick the buns of any hot cocoa you’ve ever had (let alone made yourself), its variations are nearly infinite, to fit any dietary restriction or preference or taste. These measurements are only suggestions. Usually, hot-cocoa recipes call for much more sweetener than cocoa. 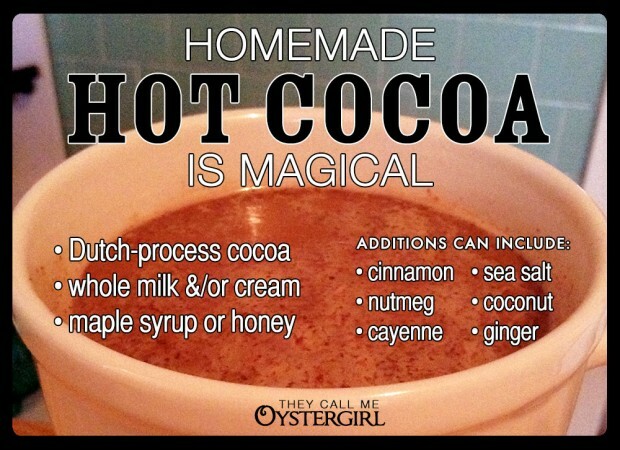 This recipe is more balanced if you use the Dutch-process cocoa (see astericked comment below). However, it is still a very personal thing. That’s one great thing about homemade hot cocoa. You can find your own sweetness depending on your taste and mood. * Or coconut milk, or almond milk, or water, or cold coffee, or whatever. ** Dutch-process cocoa has a milder taste than regular “natural” cocoa, so it doesn’t need as much added sweetener. The best deal I’ve found for it is here on Amazon. *** Or regular sugar, or “raw” sugar, or any sweetener you’d like. 1. Mix the cocoa in a smallish amount of the milk. Stir it vigorously until it forms a paste. 2. Add the rest of the milk, sweetener, and additions. 3. Heat on stovetop over low-medium heat. 4. Don’t let it boil! Stir occasionally and when it’s fully dissolved and your preferred drinking temperature, it’s ready. **** The hot cocoa pictured above contains several dashes of cinnamon, two dashes of sea salt, a dash each of turmeric, mace (like nutmeg only stronger), and cayenne, plus a few shakes of toasted shredded coconut, which was lovely to chew on after the sip of cocoa was gone. Kahlua and whipped cream, if I’m being honest. Be healthier and skip the whipped cream and add Bailey’s. Ha ha. Oh my god yes. I make my own whipped cream (of course), so that’s easy to make healthy. I also know someone who makes their own Irish cream liqueur. That’s a worthy cause. i love my cappio…1/2 c each of cocoa & instant coffee & 1TB of stevia – shake together well, add 1 heaping T to each 8-10 oz c of desired milk…mmmm, so yummy! Another good combination, thanks for sharing!